Over the next few weeks World Footy News will release region by region reviews of the 2004 census data collected to give a snapshot of the state of Australian football around the world. Our first article looks at the numbers in North America. The World Footy Census 2004 used the criteria that for a player to qualify they must have played at least four games in the year. Of course, much of the data is approximate, but we are confident that results are reasonably accurate. The criteria are discussed in more detail is our original story on the census. This census has proven to be a massive task, with not too many leagues or clubs directly contacting us as we had hoped. Instead, direct contact has had to be made, making the task much more time consuming for a small number of volunteer staff. We are still awaiting quite a few results for some regions, and hope we do not have to estimate them ourselves. We are pleased to report that most North American clubs or leagues did ultimately respond, and we present the information here. Thank you to all who helped. Please remember, some of these numbers are estimates. Australian Football got its North American start in Canada in 1989 with the Mississauga Mustangs and Toronto Panthers, which lead to the formation of the Canadian Australian Football Association (now called AFL Canada) and a very strong league in the province of Ontario. Most of the clubs listed below are from that region, but in recent years there has been growth to the west, with Vancouver and Victoria in British Columbia, and Calgary and Red Deer in Alberta. This tallies up to around 314 adult players in Canada, across 14 clubs. Particular thanks to OAFL registrar Bruce Parker for help with the data. On the junior front, the OAFL have previously done large clinics for schools, but have struggled to keep them going, although some work still goes on. The only regular junior program with enough games to qualify under the four game criteria was the North Delta Junior AFL in Vancouver, with around 50 children playing in 6 teams. Still, Canada seems well placed to capitalise on a solid club base, and hopefully some funding can be found for a full time development officer. In the United States, the first modern signs of Australian Football began in 1996, with the Cincinatti Dockers and Louisville Cats. Growth has been quite rapid, but with such a large population over a massive geograpic area (similar in size to Australia), reaching "critical mass" in any one region has been difficult. In 2004 several leagues were played across state boundaries (the NWPAFL, MAAFL, NEAFL, SEAFL and the Californian league that was not completed), and numerous metro leagues ran out of one city or state (e.g. the GGAFL with 4 teams and the AZAFL with 6). Several college teams have begun, but often the bulk of the players primarily play with their local club, so have generally been listed there to avoid double-counting. A major change towards the end of 2004 was the merger of the two Chicago clubs, and the announcement of a TV deal which might see major changes in the next few years. Adding up all these clubs leads to around 38 active clubs and 855 regular adult players. This impressive amount in just 9 years is actually a bit less than the numbers usually quoted for the US, and probably reflects the difference between very occasional players who pass through clubs and those that are regular players. So a figure of around 2000 players "on the books" is about right for the US. There have also been several women's sides set up, playing a slightly less contact version of the game, but the teams also face the same distance problems that the men do, and we could not establish that any players satisfied the minimum 4 game criteria in 2004. On the junior front, US Footy Kids has attempted to spread the word, as have individual clubs, but as with Canada, not too many regular junior leagues have been run. The Golden Gate AFL spin-off juniors has been the major exception, with around 25 children playing regularly, and around 15 in Nashville, giving a total of 40. 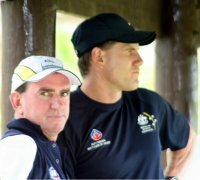 Both the Canadian Northwind and US Revolution national sides are being prepared with increased professionalism in 2004/05 for the 2005 International Cup in Melbourne. Improved showings are expected from both, but in the longer term, they will need greater junior development to compete with some of the emerging countries such as South Africa and Papua New Guinea, where much of the growth is amongst children. Note: data subject to small amendments if new information arrives.